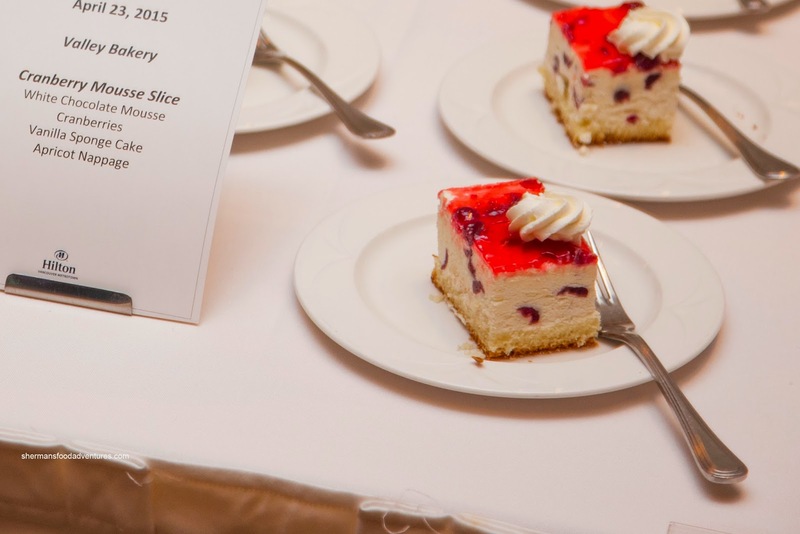 Every 2 years, a very worthy fundraiser is held at the Metrotown Hilton. 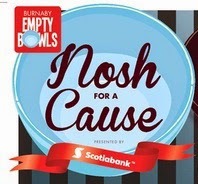 The Burnaby Empty Bowls "Nosh for a Cause" brings together some tasty bites and live music to go along with a silent auction. Miss Y and I were fortunate enough to be invited to attend the event where the proceeds go to the Burnaby Empty Bowls Committee, a coalition of community service organizations and community members who work to address issues of food security and hunger in Burnaby. 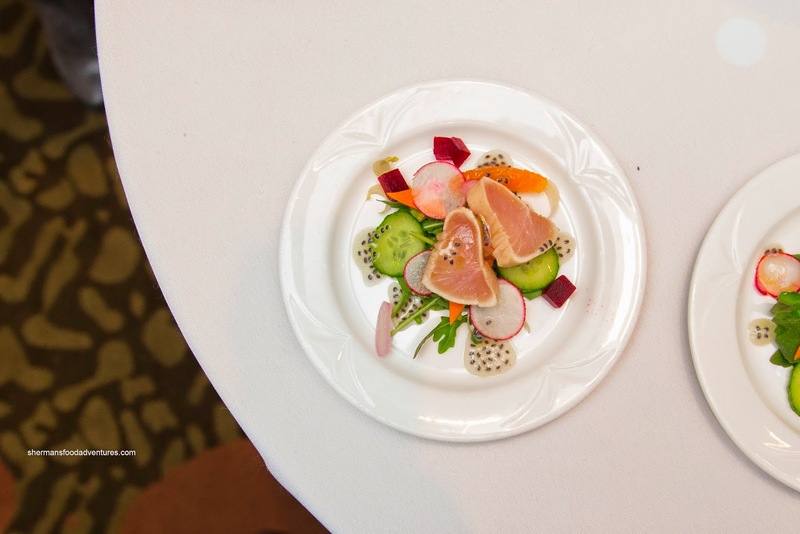 We visited the Ocean Mama Seafood first and sampled the Oceanwise BC Albacore Tuna Tataki atop baby arugula and endive salad, pickled veggies and drizzled with a basil seed vinaigrette. Colourful and beautifully plated, the dish ate as good as it looked. With vibrant and clean flavours, there as a good balance of acidity which did not overwhelm the delicate tuna. 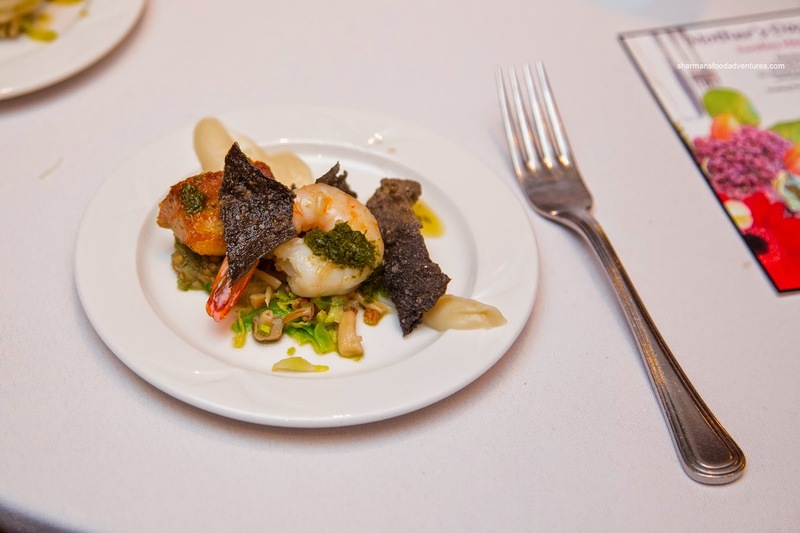 Their second offering was the Crispy Pork Belly with butter-poached Oceanwise shrimp, cauliflower puree, salsa verde and nori chips. This was a study in textures as there was crunchy to go with the succulent pork belly as well as the sweet snap of the large shrimp. 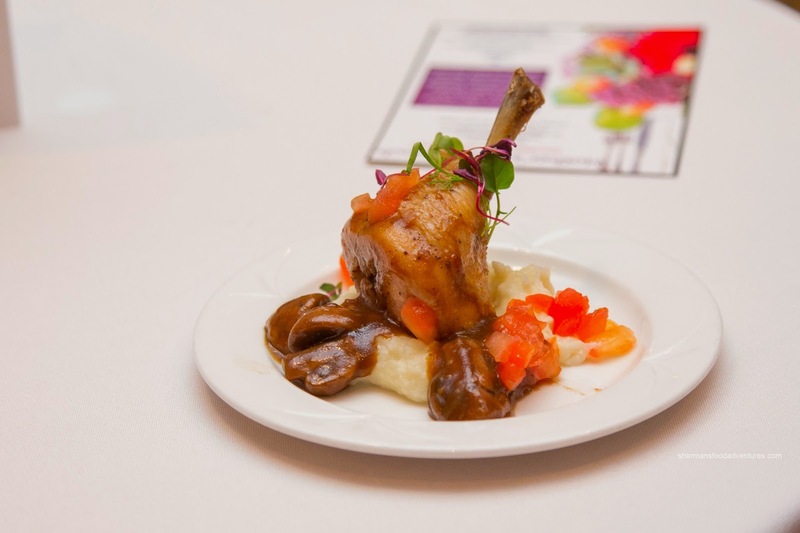 Right next door was the Burnaby Ace-It Culinary Arts Program, where young aspiring chefs served up 2 items including a Chicken Drumstick atop potato & cauliflower puree finished off with a mushroom sauce. The generous portion of chicken was meaty while still sufficiently tender. The star of the plate was the mushroom sauce as it was velvety, woodsy and well-seasoned. Going for an early dessert, we tried their Raspberry-Chocolate Macarons with coconut flakes and a side of panna cotta. Texturally, the macarons were delicately crisp on the outside while densely chewy on the inside. The cream filling was a bit too light, but the raspberry sauce made up for it with a sweet tartness. Over at Cioffi's, we were served 2 versions of their "sandwiches". I've had their sandwiches before and I can vouch that the bread is much better than the ones served at this event. 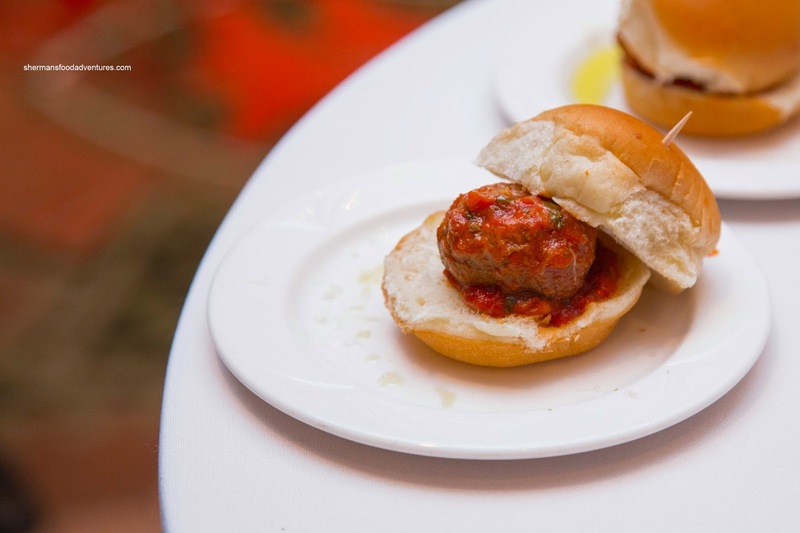 Hence, the cold and relatively heavy slider buns hindered what was a beautiful meatball. The "Angelo" Meatball itself was firm, yet not heavy with lots of natural texture and enough seasoning. The tomato sauce was nicely balanced with a slight tartness. 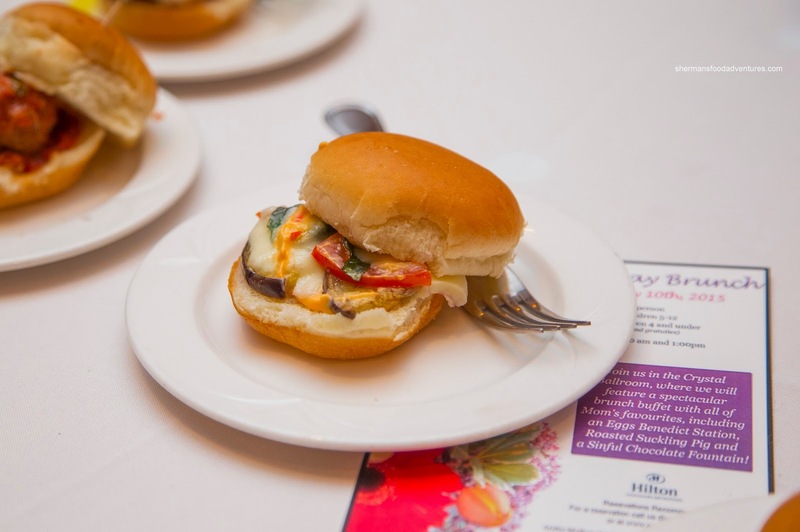 As for the other slider, it was a vegetarian option consisting of Eggplant & Parmesan with basil and tomato. This was pretty mild with only the salty cheesiness of the Parm having any impact. I much preferred the meatball (because I am a meatatarian!). Moving onto the Pear Tree, there were 2 composed dishes to greet us. 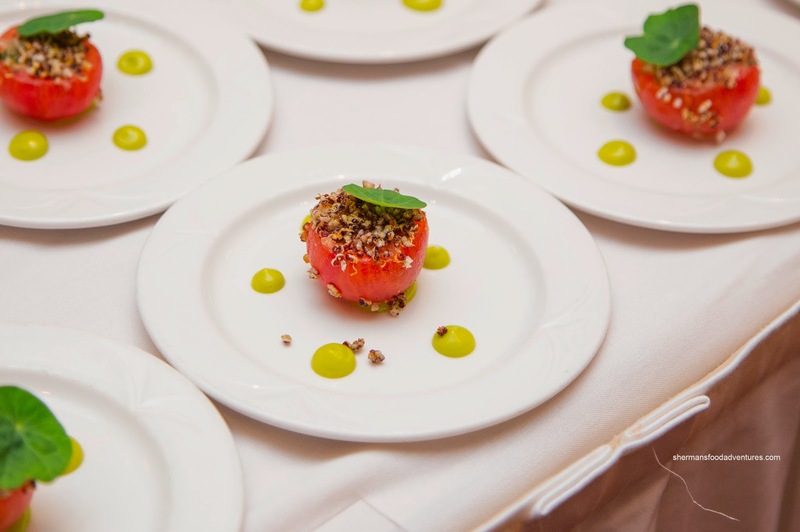 First off, we tried the Candied Steelhead served in a small half-tomato with red quinoa and fennel salad. Inside, the salmon was sweet and flaky while the tomato added a refreshing background tartness. Not sure where the fennel was because I didn't get much of it. 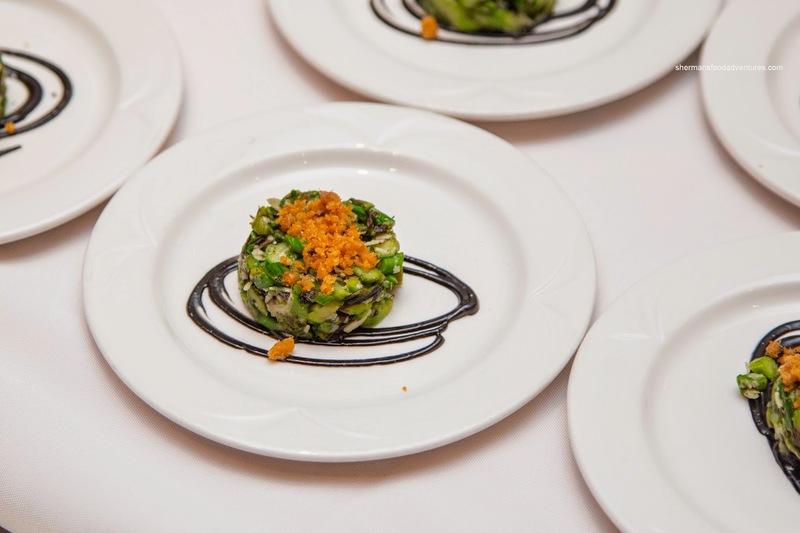 Next, we had the Chargrilled Green Asparagus with chicken crackling, Grana Padano and squid ink. Notably smoky and nicely seasoned by the salty cheese, the asparagus retained a nice bite. Providing a crunchy contrast, the cracklings also had an appealing aroma. I do not hide my respect for Chef Hamid Salimian, so I was quite excited to try NextJen Gluten-Free. 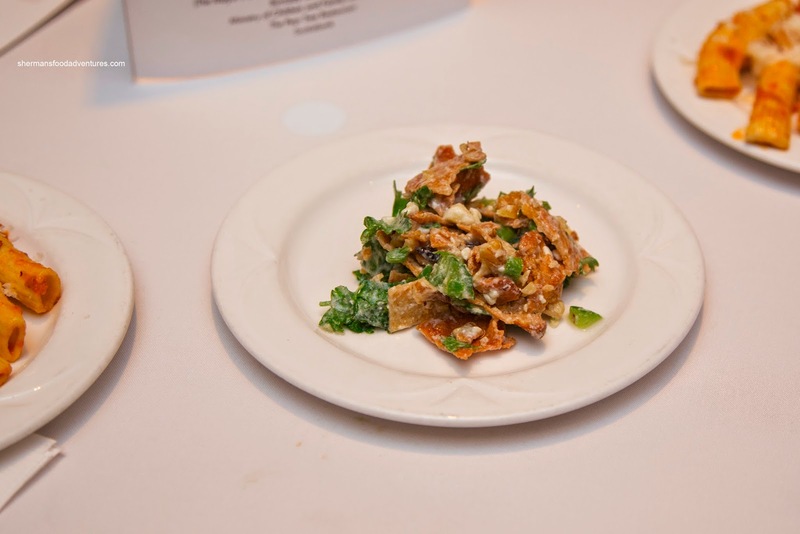 Along with Chef & Founder Jen Peters, they offered up 2 dishes including Persian Bread Salad consisting of Sangak bread, arugula, dates, walnuts and feta. This was a crunchy (from the bread and the walnuts) and sweet concoction that was also a bit creamy from the feta. Next was the Fresh Extruded Rigatoni with chorizo tomato eggplant ragu. 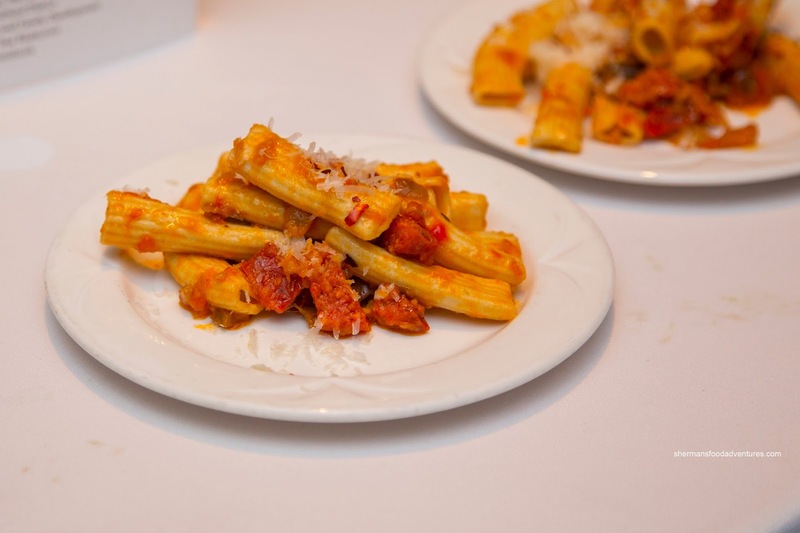 Although a bit softer than an al dente wheat pasta, the rigatoni could fool many into believing it was not gluten-free. I really liked the ragu as it was rustic, tart, spicy and rich. 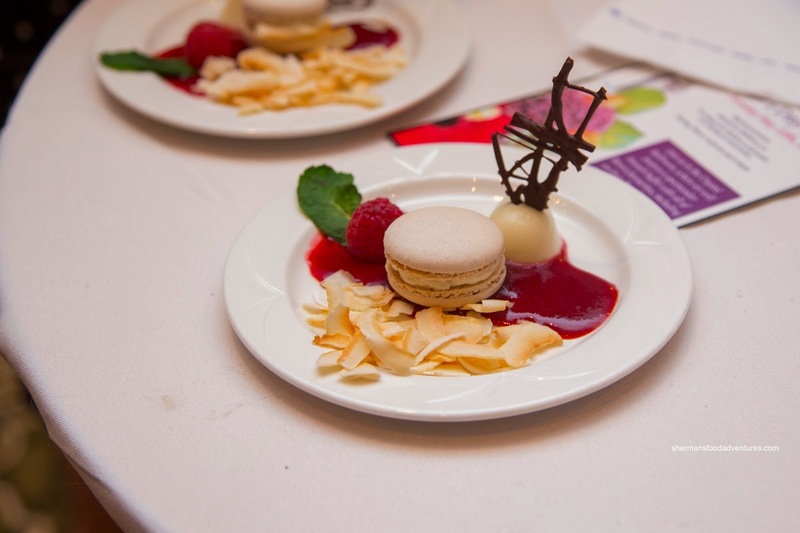 Last but not least, our favourite dish of the nite was from the host hotel being the Hilton Metrotown. 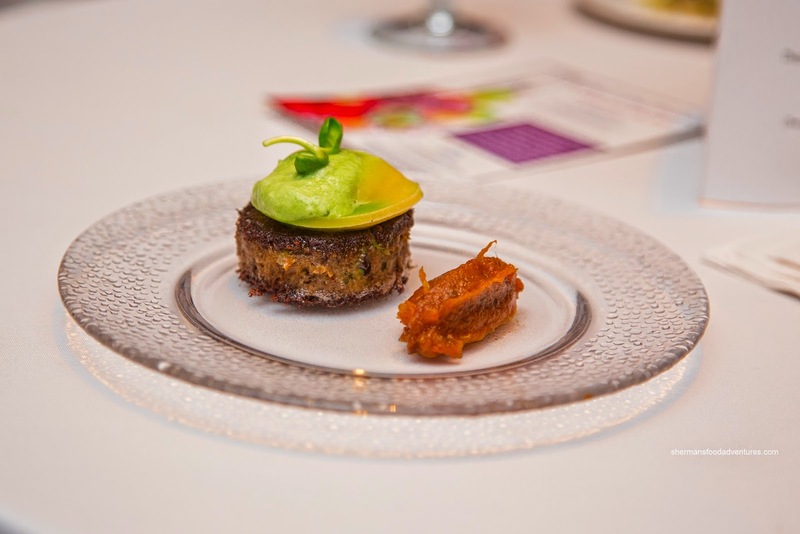 The dish featured a Braised Elk Roulade topped with a truffle butternut squash ravioli and served with a side of tomato jam. Seared in butter, the elk roulade had a caramelized crispy exterior that gave way to a surprisingly moist interior. There was no mistaking the elk gaminess, but it was pleasant. Sweet and impactful, the tomato jam added that extra oomph to the already tasty elk. As for the ravioli, the fresh pasta was expertly toothsome while quite mild in taste. For dessert, we wandered over to Valley Bakery for the Cranberry Mousse Slice consisting of white chocolate mousse, cranberries, vanilla sponge cake and apricot nappage. This relatively light dessert was purposefully sweet with the slight tang from the cranberries. I wasn't going to eat it all, but did anyways. In fact, we ate one of everything (and a few duplicates) resulting in very full tummies at the end. However, there are many that are not as lucky. This highlights the meaning behind the event and the fact, we could do more in helping the less fortunate.